It's not really a surprise that Fuzzball's decided to give up; you can see him giving into despair here, after his house blew up. 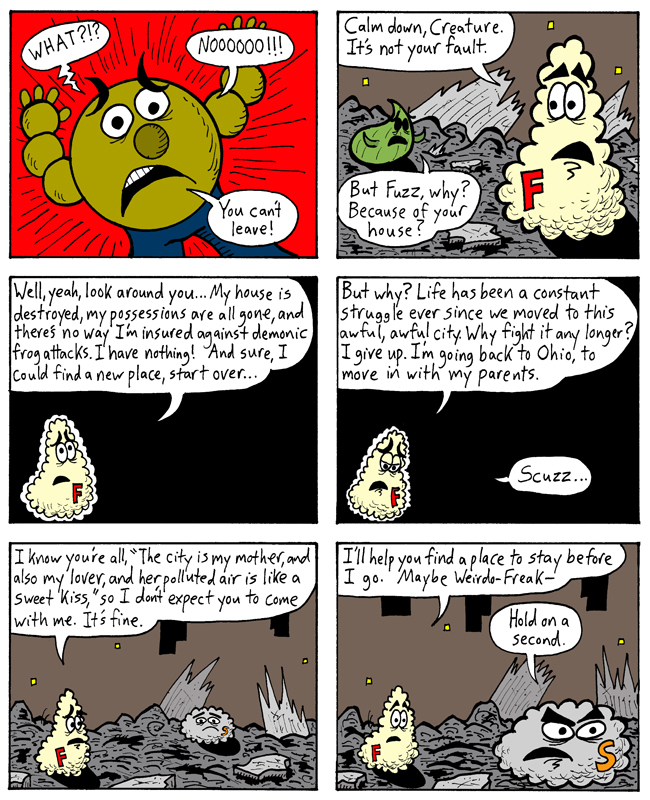 In fact, you can see him despairing about life in Happy City here, in this strip from long ago, and various other places. Basically, it makes sense for him to move back home. The only reason for him to stay would be if I contrived some excuse in order to maintain the status quo. But the status quo has exploded, and now lies in ruins! Anything can happen! NEXT WEEK: Scuzzball has a fateful conversation! And it's only TWO WEEKS until everything wraps up in Fuzzball & Scuzzball #300! Prepare yourself!